For 21 years prior to 2003, I had occupied management positions in various government agencies and private firms. In these positions of authority, I considered myself a fairly effective and efficient manager. I never considered myself as a leader then; I looked at myself more as, in the words of Peter Drucker, an “effective executive.” I was able to achieve organizational goals with my staff, basically through the legitimate power of my position in a directive but not authoritarian manner while maintaining harmonious relationships within the department. During my corporate years in the late 70s through the 90s, being good at management, was the concern in organizations rather leadership. Thus, I developed my managerial skills capping my training with a master’s in business administration degree from the Ateneo Graduate School of Business in 1989. This management emphasis must have been in sync with worldwide developments as Joseph Rost (1991) observed that the prevalent thinking in the 70s was that “leadership equals management” (p. 58) He also noted that that it was only in the 70s that interest in, and consequently, literature on leadership started to grow (p. 59). Immersed in managing, I was not aware of these developments in leadership theories starting at that time. And I would suppose, except for a few sectors, many in management positions in the private sector during those years were also not updated on these developments. Based on how Rost distinguished leadership from management, I would say that my first leadership experience was when I conceptualized, initiated and organized a public service program called My Trabaho in 2004. Having been in human resources management for over 21 years, I had been on the employer side of jobs–recruiting, selecting and hiring to fill job vacancies for my companies. I felt that it was time for me to share my expertise with the people on the other side of the job fence—the jobseekers who were having difficulties finding a job—and in the process, help in nation building. This was also aligned with my work at that time, being the editor of the first ever career section in a national broadsheet, the People at Work subsection of the Philippine Daily Inquirer which I had conceptualized and initiated in 2000. The subsection targeted people at work and jobseekers at its readers. My Trabaho was a leadership challenge: it required me to mobilize resources not just within my organization, the Philippine Daily Inquirer, but also with other companies who would be willing to donate their knowledge, expertise and resources necessary to implement the project. The My Trabaho program was composed of three components. The first was “My Trabaho Dream” which provided selected beneficiaries with career planning, coaching and personality development services to increase their chances in getting their dream jobs. Every quarter, beneficiaries were given free training on career planning. Afterwards, career counselors selected a few beneficiaries who were then given additional benefits like job coaching, outfits, makeover, training on how to prepare a resume and pass a job interview, and a job hunting cash allowance. Training and consulting companies donated their services to mentor the beneficiaries. The stories of the beneficiaries were featured in the People at Work subsection of the Philippine Daily Inquirer. This was a joint effort of Philippine Daily Inquirer, Optimus Innovations, Inc. (a management consultancy and training company which I founded) with the support of other leading management consultancy and training companies like Ancilla Enterprise Development Consulting Inc., Career Systems, Inc. and Drake Beam Morin. The second component was “My Trabaho at dzRH,” a joint project of Optimus Innovations, Inc. and Manila Broadcasting Company. This was a radio program aired every Wednesday from 3:00 p.m. to 4:00 p.m. over dzRH. The program aired job opportunities for job seekers, job hunting tips, and career information and advice to listeners, the first radio program to do so in the country. These first and second components were launched in March 2004. After these two programs were launched, a third component was added, which was named “My Trabaho Match.” This project provided a link between jobseekers and employers to facilitate employment of applicants qualified for vacant positions. The link was an online resume databank service that brought jobseekers within reach of prospective employers with a click of a mouse. 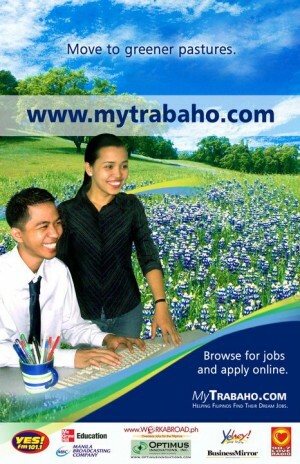 Through the web site, http://www.mytrabaho.com, jobseekers encoded their resumes online. Job hunters who did not have access to a computer sent or dropped off their resumes at designated drop off centers nationwide. This component was introduced to the public in February 2005. In addition to Inquirer, MBC and Optimus, two other companies, STI Colleges and Quantum X, a software development company, joined the consortium. The My Trabaho Program secured the support of government institutions through then Finance secretary Cesar Purisima and Department of Labor and Employment secretary Patricia Sto. Tomas. Rost defines leadership as “an influence relationship among leaders and followers who intend real changes that reflect their mutual purposes.” My role in the MyTrabaho Program fulfilled the criteria of this definition. As the initiator of this project under the umbrella of Optimus Innovations, I had to look for companies who would be able to link their corporate goals with the mission of MyTrabaho to help jobseekers. It was a challenge presenting the proposal to Inquirer president Sandy Prieto Romualdez, Manila Broadcasting president Jun Nicdao, STI chairman Eusebio Tanco, and Quantum X president Robert Oh and findings ways in which they could find value in the project for their respective companies and more importantly, for the nation as well. In this sense, I and the heads of the four other companies established “an influence relationship” wherein through frequent discussions and consultations, we crafted the program. Being the initiator of the project, I was placed in a leadership role, although my company, Optimus Innovations, was a “dwarf” compared to the other four companies which are “giants” and leaders in their respective industries. It was an “unequal relationship” because, unlike the definition of Rost, the “followers” had significantly more resources than the “leader.” What actually supported the leader’s role was the strong backing of the Inquirer, whose chair, Marixi Prieto, and president, Sandy Romualdez, believed strongly in the social impact of the project in alignment with the People at Work subsection and Job Market classified ads section. Nevertheless, the influence relationship was “multidirectional” and definitely “noncoercive.” All the member companies and their organizations were active in the project and implementation of the project was led by each company in their area of expertise and in accordance with a memorandum of agreement. What were the “real changes” sought by the consortium? The tag line of MyTrabaho was “helping Filipinos find their dream jobs.” This mission was formulated to address the “matching” gap of jobseekers and job opportunities arising from the lack of knowledge and competence of jobseekers on how to apply and get hired for a job. This gap lengthens the time delay of jobseekers finding the jobs they want which in turn impacts on the ability of the jobseekers to support their families. The project sought to fill in the gap by personally coaching and mentoring individuals, sharing their success stories through Inquirer and dzRH so that other jobseekers would be able to learn from their experiences and providing a cost free hub (the web site) where their matching would be facilitated. This actually was in line with the “purposes” of the different companies involved in the project with regard to their market: the readers of Inquirer’s People at Work section and Job Market, MBC’s listeners from middle and lower income levels, STI’s students who would eventually become jobseekers and Quantum X’s Workabroad.ph’s users. It was a synchronization of common corporate purposes and social goals. The project was implemented for around two years. It was able to help a considerable number of jobseekers and reached hundreds of thousands of readers, listeners and web site visitors. Unfortunately, changes within the organization of Inquirer resulted in the premature cutting of their support for the project which in turn affected the support of the other companies in the consortium. This resulted in the weakening of the “influence” of the initiator and the eventual termination of the agreement. This experience has taught me that a worthwhile and noble vision can inspire others to participate in a public service project. I think I was able to facilitate the convergence of corporate purposes with social responsibility. It has also taught me that passion, sincerity, determination and a strong intention are necessary in the effectiveness of the influencing process. Unfortunately, I was not able to discern ahead of time the internal changes in the Inquirer organization that led to its withdrawal of support for the project. Despite this, the project continued and transformed itself into a self-sustaining enterprise with new partners. It lived until 2010 when an unforeseen tragic event in one its partner companies rendered the project unable to continue operations. From this experience, I found leadership to be an exhilarating but challenging experience. It enables dreams (my own and others) to be turned into reality. However, a person in a leading role needs to have the passion, energy and stamina to lead. Otherwise, she would not be able to energize others as well towards their “mutual purposes.” In this sense, I agree with Rajeev Peshawaria who defined leadership as “the art of harnessing human energy towards the creation of a better future” (2011). On hindsight, I would also have benefited from the concepts of learning-centered transformational leadership. Don Dunoon (2002) cited from Heifetz (1994) that “Leadership, from this standpoint, is essentially about capacity building” (p. 8). As the initiator, I should have strengthened and institutionalized the organizational framework of the project through capacity building instead of totally relying on the member companies’ organizations to implement the program. In a learner-centered leadership approach, the leader enables people “to frame problems differently,” to “open possibilities for acting that otherwise could well have been outside their field of view” (p. 8). Transformational leadership was what was needed in that leadership moment. James MacGregor Burns writes about transforming leadership which “occurs when one or more persons engage with others in such a way that leaders and followers raise one another to higher levels of motivation and morality” (1978, p. 20). I failed to engage the stakeholders and motivate them beyond the limits of their own corporate interests. At the peak of their support, I should have anchored the project in a formal organization such as a foundation that would have withstood the internal politics of their respective organizations thereby transforming their initial intentions to a stronger and “nobler” one. Overall, comparing my managerial experience with my leadership experience, I find management a fairly easy task because the strength of a formal position and status enables the achievement of group or organizational goals. On the other hand, leadership is more difficult because it has to result in change and relies on the powers of your persuasion and other influencing tools to facilitate action. However, in a rapidly changing world, it seems that managerial skills are no longer enough to for an organization to thrive. More and more, transformational leadership is what is essential to the continued development of organizations and institutions in the private and public sectors. Burns, J. M. (1978). Leadership. New York: Harper & Row, Publishers. Dunoon, D. (2002, September). Rethinking leadership for the public sector. Australian Journal of Public Administration, 61(3), 3-18. Peshawaria, R. (2011). Too many bosses, too few leaders: The three essential principles you need to become an extraordinary leader. New York: Free Press.